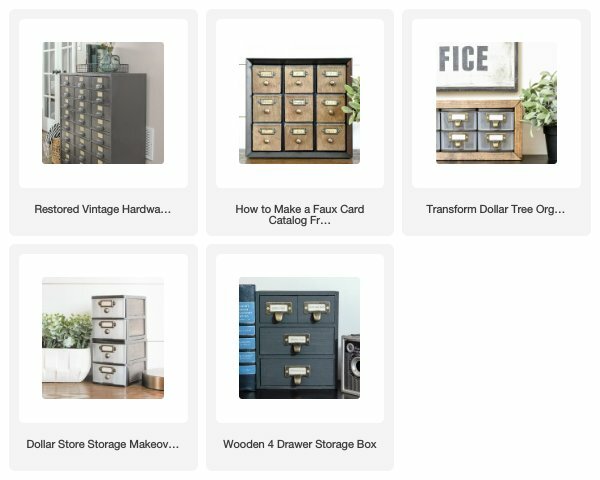 An easy way to give new and inexpensive wood storage drawers a vintage industrial look using paint and stain. I usually go to Michaels with a project in mind and a supply list in hand. Other times, I go solely to wander up an down the aisles with no plan or direction. The other week was one of those times that I headed to Michaels without a list or plan. 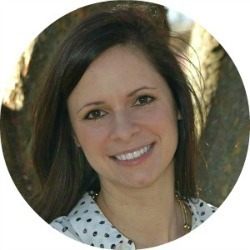 I had a 20% off your entire order coupon (you know you can't let those go to waste!) and was hoping something would catch my eye. 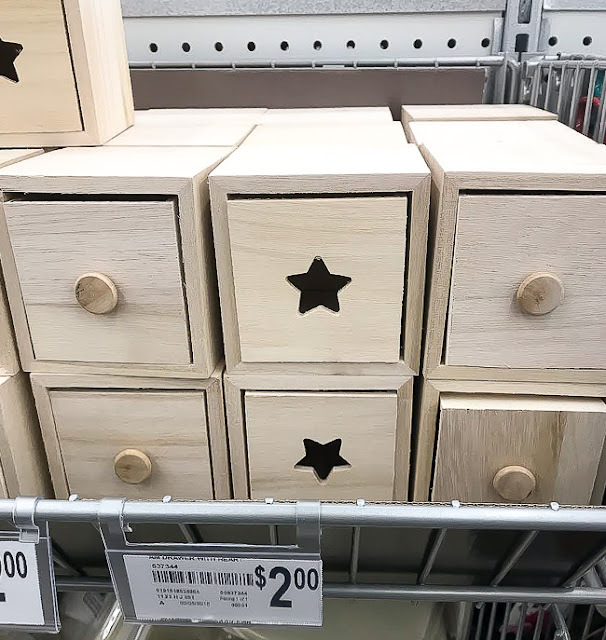 I picked up a few crafts for my daughter and was headed to the checkout when I spotted mini wood storage drawers. 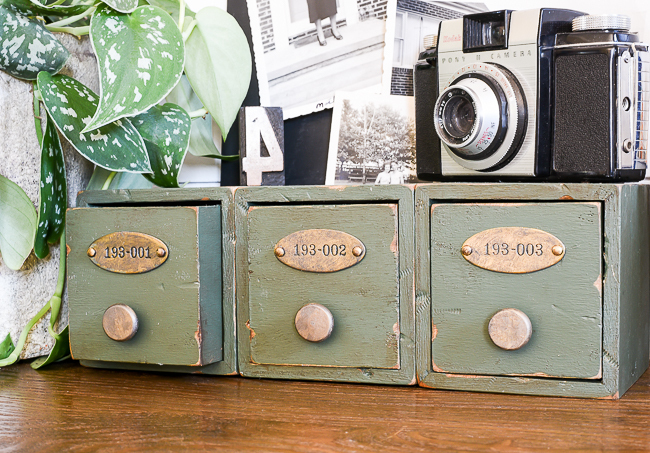 I had never seen these drawers before and knew with a little paint and stain I could easily give them a vintage industrial makeover. 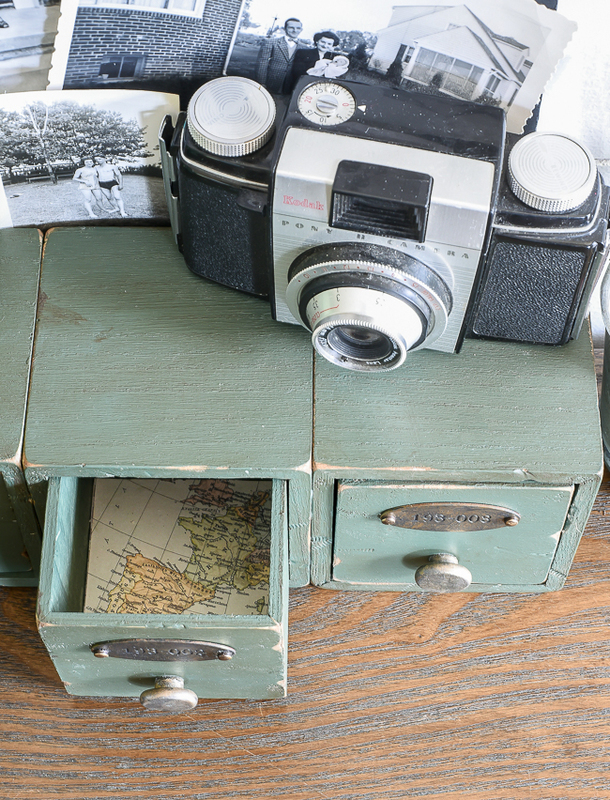 These mini wood storage drawers are near the checkout and come in three different designs. I grabbed the ones with the little button knobs and used a 20% off coupon making them $1.60 a piece. 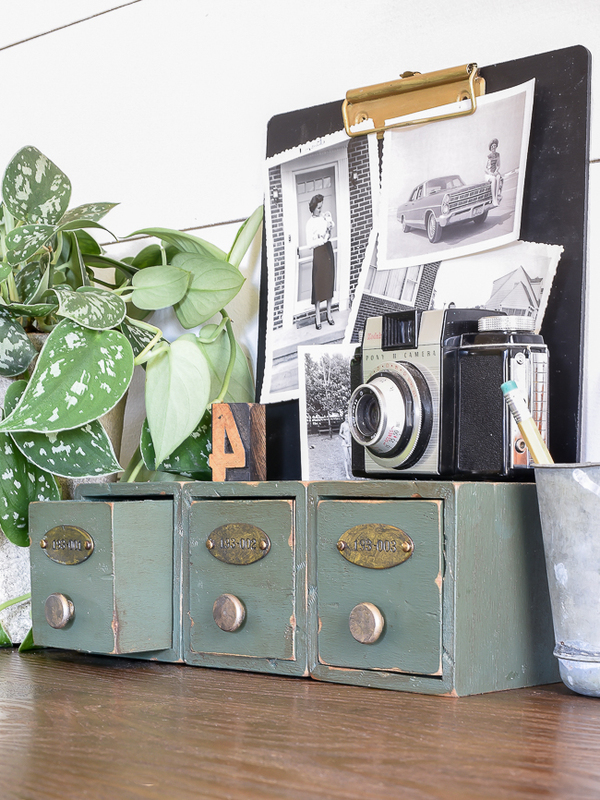 Old vintage wood has a lot of imperfections, so you'll need to mimic that look and give your storage drawers a few dents and dings. 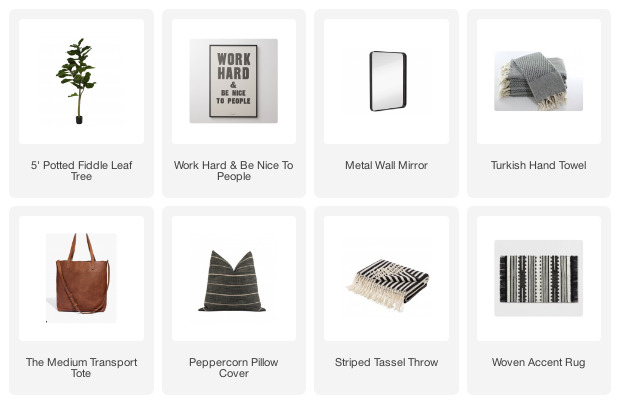 I grabbed a couple items from around our home (hammer, screw and seam ripper), but you can use whatever items you have available. 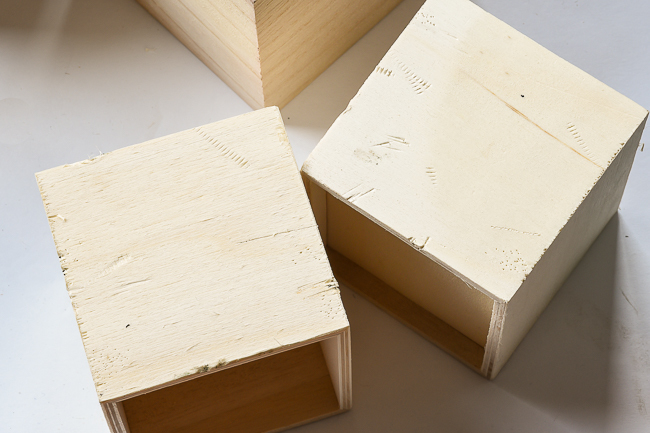 The object is to add dents, puncture holes and random marks to age your wood. 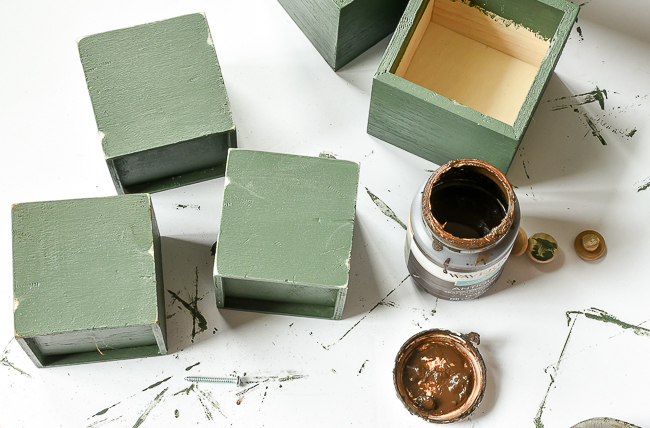 After you have your wood banged up a bit, add a couple coats of your favorite paint. 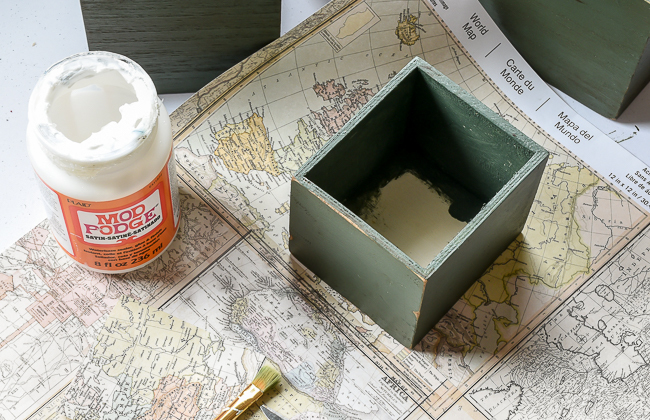 I used Sherwin-Williams Forestwood since I just bought a quart for another project and thought it would look great paired with the antique wax. 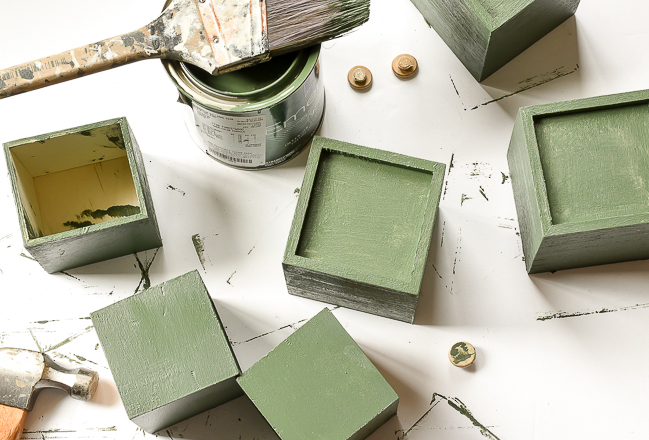 After the paint is dry, add a few more holes and blemishes to make sure the imperfections really stand out. 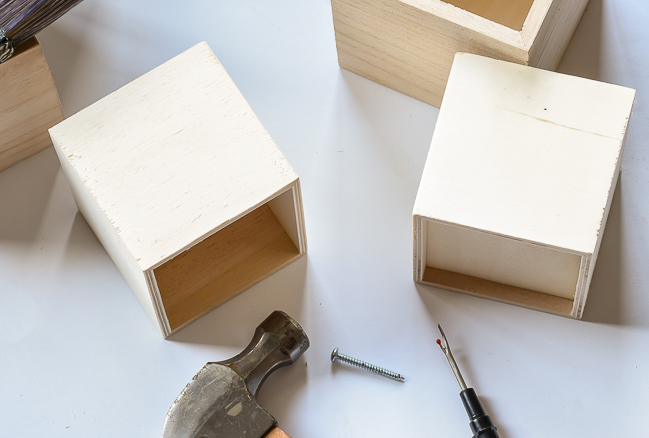 Take a piece of sand paper and sand the corners, edges and random spots on both the drawers and outer boxes. 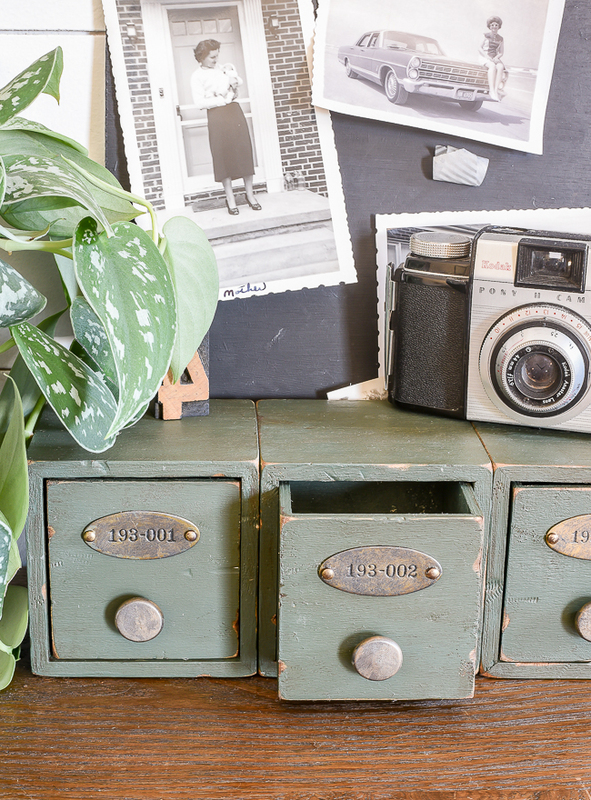 Apply a layer of antique wax over all the boxes and drawers. If you don't have a fancy wax brush a simple paper towel will do. 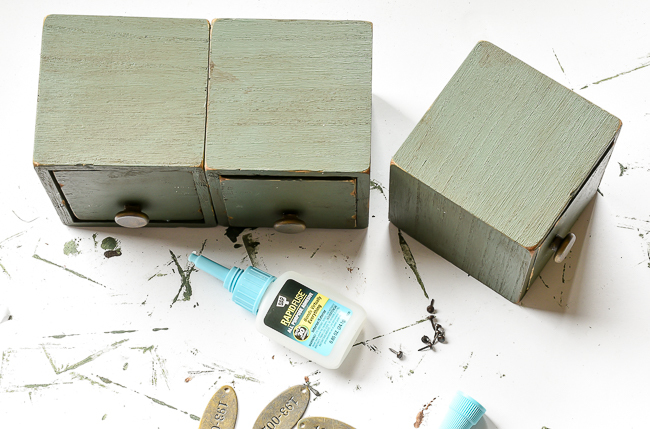 You can simply paint the inside of your drawers or add scrapbook paper for a fun surprise. 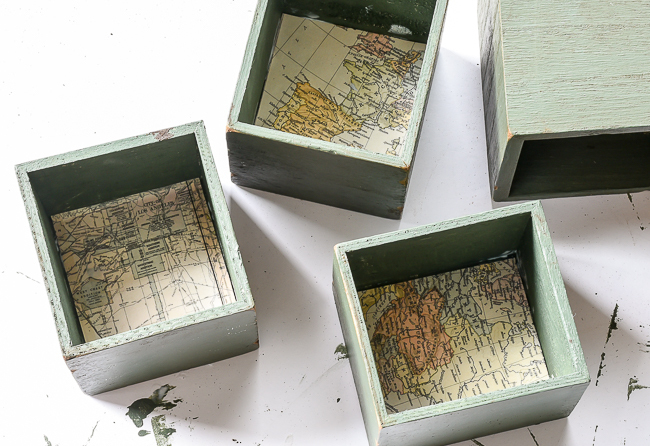 I chose to add world map scrapbook paper to the bottom of my drawers, which I attached using Mod Podge. I used ORB metallic craft paint and Gold Leaf Rub 'n Buff to "age" the wood knobs and vintage brass tags that I had leftover from a previous project. 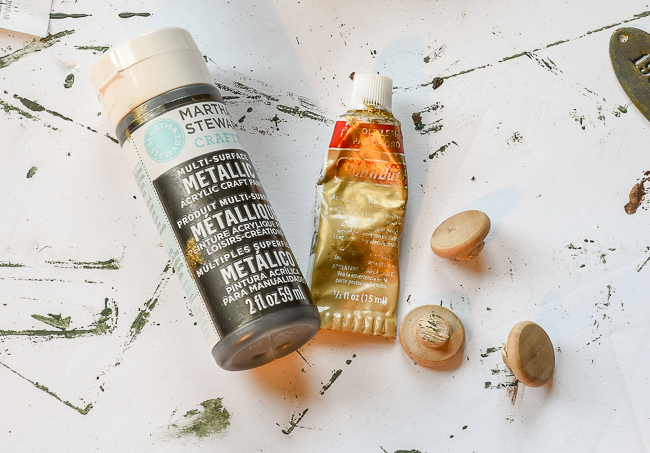 I added Rub 'n Buff first then mixed in ORB metallic paint while the Rub 'n Buff was still wet. I chose to glue my boxes together horizontally using Rapid Fuse All Purpose Adhesive. Another option would be to leave them seperate or attach them vertically. 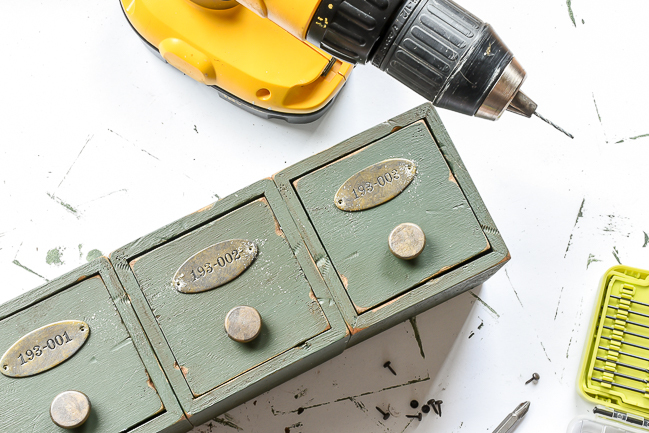 I finished off the drawers by attaching the wood knobs and vintage locker tags with Rapid Fuse then used a drill and small drill bit to drill holes for the decorative fasteners. I could not be happier with how these mini storage drawers turned out. 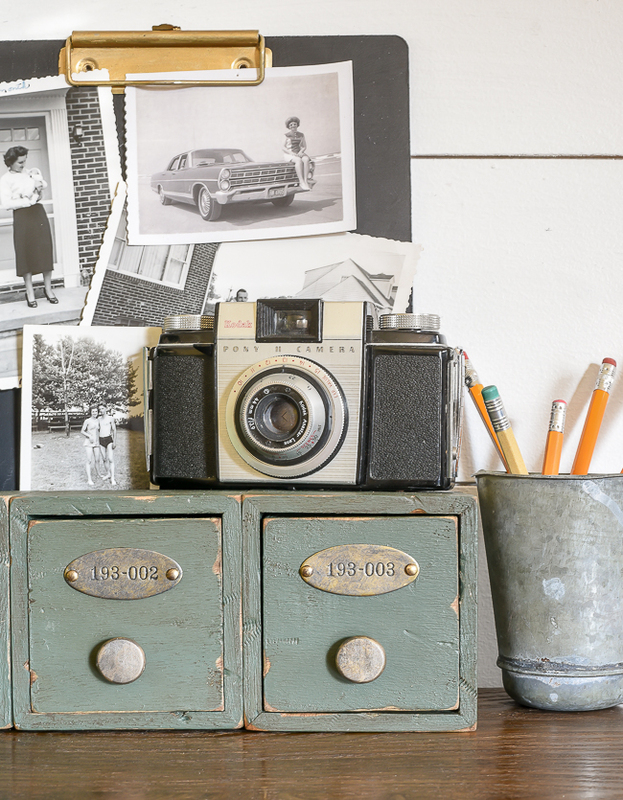 They look perfectly aged and you would never know they started out as new wood boxes. 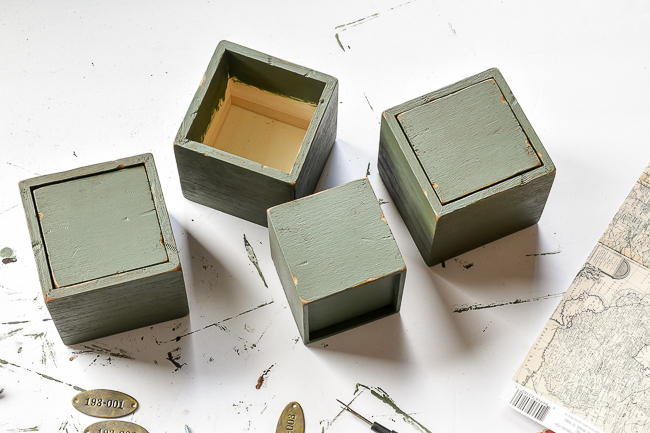 Next time you're planning a trip to Michaels be sure to add these adorable mini storage drawers to your list. 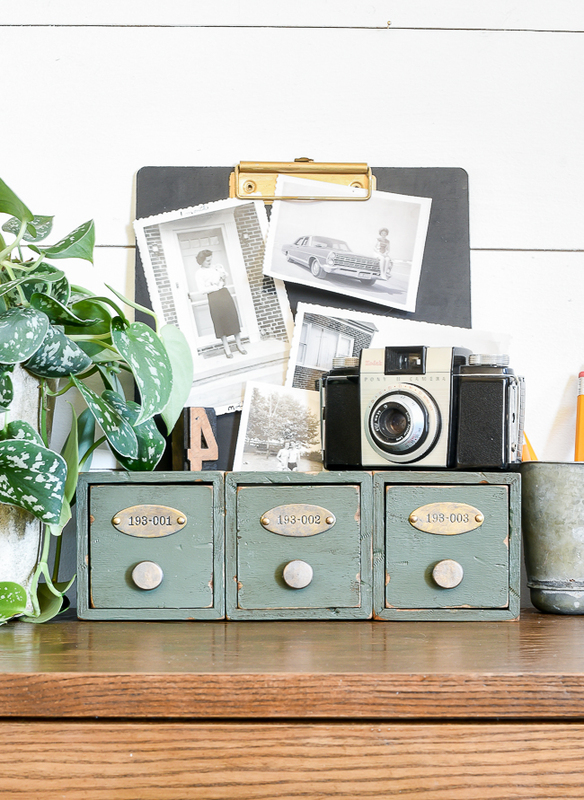 They're so easy to transform into vintage industrial storage and would make a perfect stylish addition to any office or work space. These look amazing! Can't believe they started as new wood. Appreciate all your pix and detailed directions. Those sure are cute!! The locker tags make them look authentic. Nice job!! They look amazing and vintage! They look amazing and vintage! I also love the inside "map", and the metal tags. You can still use them vertically by turning the cubes upright and just rotating the drawers. So cute! What a great idea, and yours turned out perfect. Thanks for saring.